Write-up and AMAZING photos by Kaegan Shepherd, our local marine wildlife expert! Click photos for larger image. UVic Scuba's trips to Port Hardy and Race Rocks included incredible encounters with the many types of marine mammals inhabiting this coast. As scuba divers, we have a unique insight into the strange world that these creatures inhabit. Seeing marine mammals here is always a memorable occasion. There is a lot of mystery surrounding marine mammals, and it can be hard to identify the species sighted. The most common marine mammal most of us encounter is the Harbour Seal (Phoca vitulina). These are the short, fat little creatures that come to be fed by people at Fishermans Wharf and the Oak Bay marina. They can get up to 6ft (1.85 m) and weigh in at 290 lbs (132 kg). They can be seen almost anywhere along the coastline of Vancouver Island and the mainland, either sunning themselves on the rocks, or foraging for crabs and bottom dwelling fish near the shoreline. They tend to be shy towards divers underwater but may become curious closer to their haul out sites. Pups can stay with their mother for as long as a year but only nurse for 3-4 weeks before being weaned. Unlike the seals which are tend to shy away from scuba divers, sea lions will come right up and play with you if they’re in the mood. 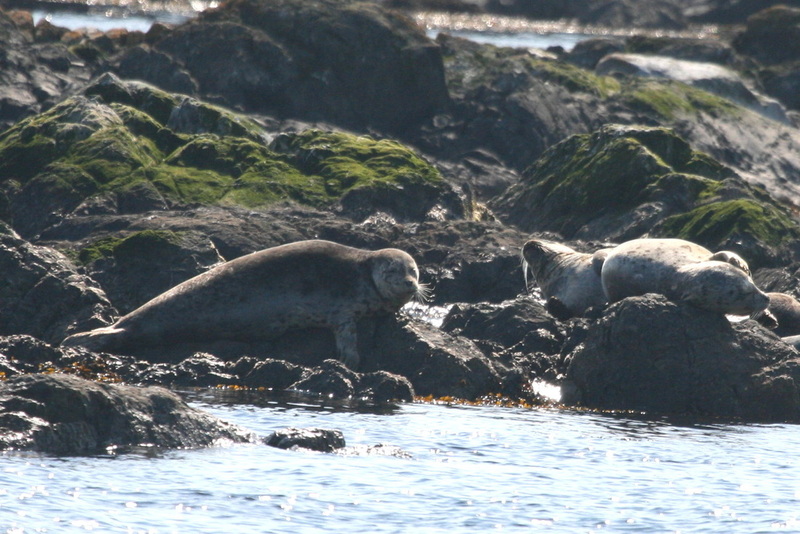 Two species of sea lion can be found off Victoria. California sea lions (Zalophus californianus) are a dark chocolate brown colour and can reach lengths of 8ft (2.4 m) and weigh around 770lbs (350 kg). Stellar sea lions (Eumetopias jubatus) are up to 11ft (3.25m) long and weigh close to 2,000lbs (1,000kg). Stellar sea lions are a lighter “tan” brown colour and are the species most likely to approach divers. 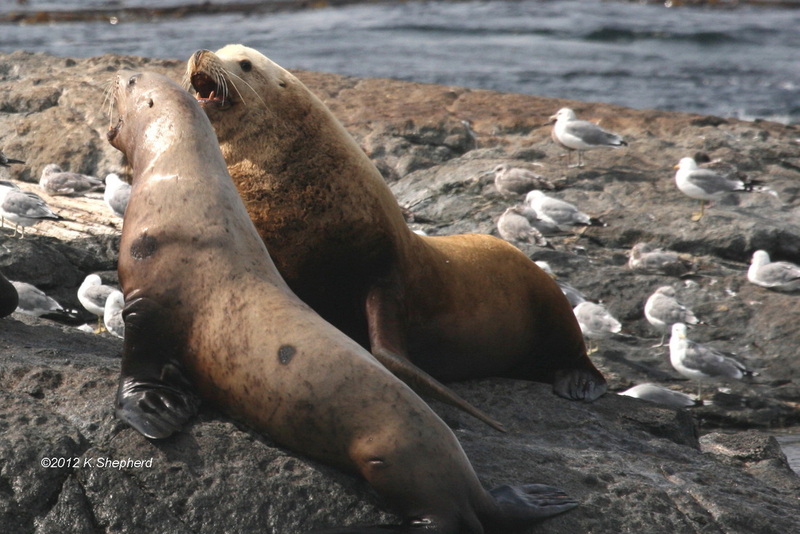 The vast majority of sea lions found off Victoria will be young “bachelor” males. They are not quite fully grown and cannot compete with the adult bulls on the breeding grounds. Race Rocks off Sooke is a hot spot for sea lions with counts of both species numbering into the hundreds. Sea lions have been known to get a little rough when playing with scuba divers, given their size, speed, and raw power, there is a serious risk of injury if you are not prepared to scuba dive with them. If you’re diving with a marine mammal that has been active but then suddenly vanishes, or bolts for the shoreline, you’ll want to stay near the bottom and look up. All the mammals listed above are prey for the top predator in this ocean, and while encountering a Killer Whale (Orcinus orca) underwater is EXTREMELY rare it never hurts to be cautious. Two distinct types of Orca inhabit these waters, “resident” Orca eat fish Primarily salmon and are usually found near steep underwater cliffs, or in the open straits. 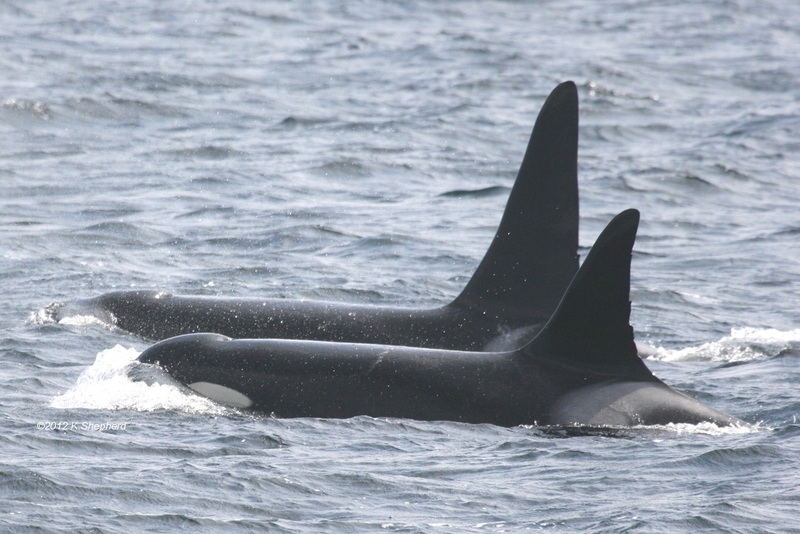 Transient (Bigg’s) Killer Whales feed exclusively on marine mammals and can be encountered almost anywhere. Orcas can grow to lengths of 32ft (9.5m) and weigh 9 tons (9,000 kg!). While no recorded human fatalities due to Killer Whales have ever been recorded in the wild, even a curious youngster could cause serious damage while investigating a scuba diver. Most of the time scuba divers see Killer Whales on their surface interval, the main thing to look for when scanning for these animals is their large triangular dorsal fin (males can have one as tall as 6ft). Please remember that all marine mammals are protected by the Canada Fisheries Act, and that is illegal to intentionally harm or harass any marine mammal. If anyone is interested in more information about any of the marine mammals described above please visit: http://www.whaleresearch.com/, http://www.pwlf.org/marinemammals.htm or track me down at any scuba club social, dive, or charter.